Bathua Raita Recipe is easy, delicious raita side dish prepared with yogurt and Parappu Keerai, a variety of local greens. The hint of garlic, green chili, and the bold mustard flavor give a sharp edge to the flavor of the Bathua Raita. 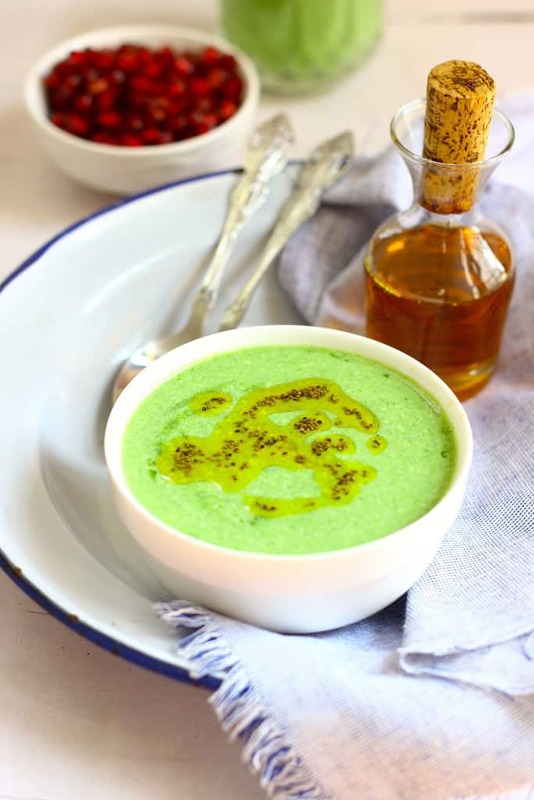 The Bathua Raita is an absolute winter favorite when the lush green bathua leaves start resurfacing in the vegetable market. 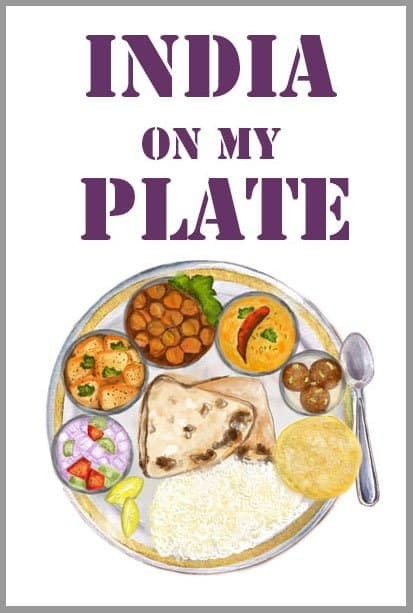 This particular condiment is a lunch hour special, served with Yellow Dal Tadka, Mixed Vegetable Sabzi and piping hot Phulkas. The combination of simple, fresh bountiful winter produce on the dining table screams out loud its winter spell of the year. The New Year embarked on a good note in the kitchen front with a new gadget making it to the shelf – Maharaja Whiteline Hand Blender. The reason for Maharaja Hand Blender getting featured on our web space too is its multi-functional caliber – blending, mashing and pureeing. 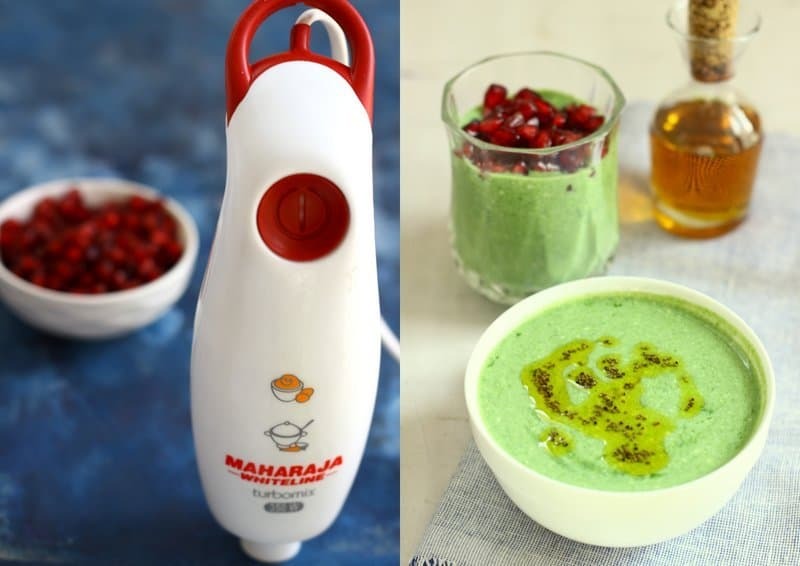 Whether it is churning breakfast smoothie, grinding masalas or pureeing soups, Maharaja Hand Blender does it all in a hassle-free manner. The Maharaja Hand Blender we are discussing is the Turbomix King Hand Blender. To make the Bathua leaves paste, we have used the small chopper jar, to blend the raita tall beaker jar is being used. The addition of two jars with the blender adds a certain ease and swiftness to your cooking. It also helps you avoid the process where you pull out your heavy food processor from the cupboard for small, everyday cooking chores. The right kind of Hand Blender is supposed to be sleek, tall, and light, with a long shaft and should be easy to mount on your wall. It should fit into different kinds of pots and pans so you don’t have to keep transferring what you’re cooking. And the Maharaja Hand Blender satisfies all these features of a good blender. The TurboMix King Model comes with a mixer attachment, one chopper, and a beaker. 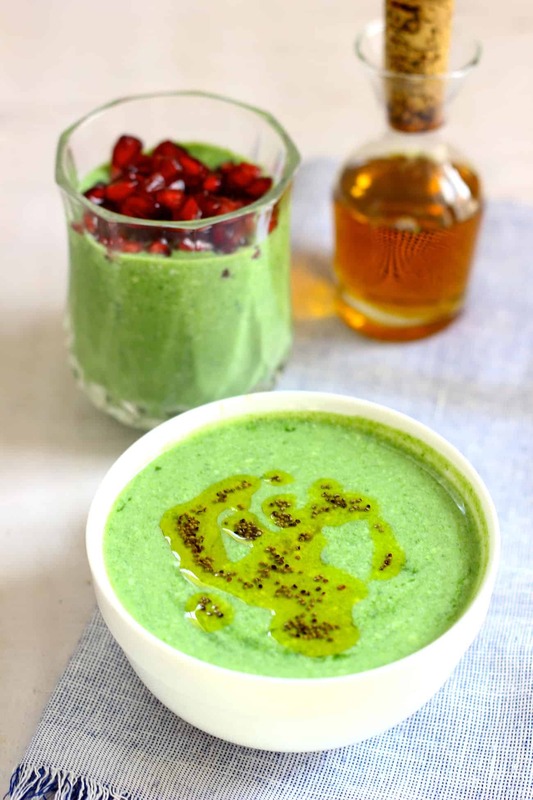 It should help you whip up thick and gorgeous smoothies, the quintessential lassi, pesto, salsa, chutneys and other everyday foods that you need on your dinner table. Easy to use, plastic upper body, where the two can be detached and cleaned easily. 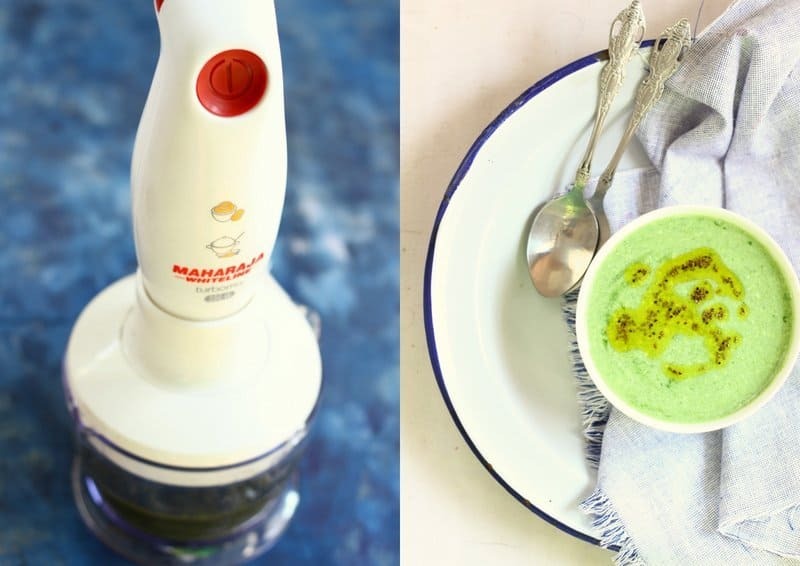 In our opinion, Maharaja Hand Blender is a good choice to bring home this New Year. Bathua Raita Recipe is easy, delicious raita side dish prepared with yoghurt and Parappu Keerai, a variety of local greens. 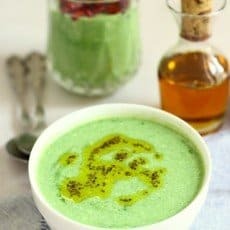 To prepare the Bathua Raita, first wash the green leaves in water. Boil enough water in a saucepan and once the water starts rapidly boiling, reduce the heat and add washed bathua leaves. Blanch the leaves in warm water for less than 5 minutes. Drain the water and let leaves cool down little bit. 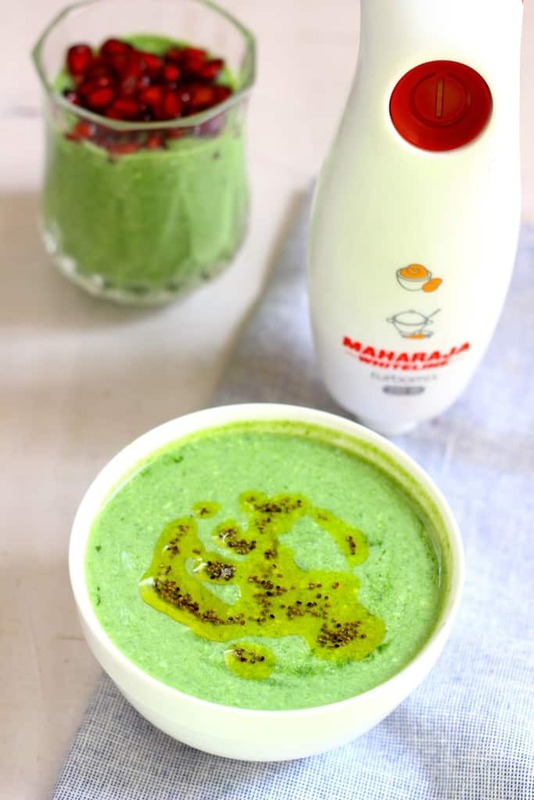 In Maharaja Hand Blender chopping jar add blanched greens, garlic, green chili along with one tablespoon of yogurt. Blend till the mixture turns into a coarse paste. Transfer to a bowl. Whisk remaining yogurt, green paste along with salt, cumin powder and red chili powder using Maharaja Hand Blender. Taste and adjust the seasoning accordingly. Transfer raita to a bowl and set aside. Heat mustard oil in a small pan over medium heat, once the oil starts fuming add mustard seeds. As the seeds start crackling, turn off the heat. Pour this seasoning over the Bathua Raita. Serve Bathua Raita at room temperature.